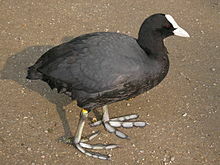 The beld(-)cuit (Fulica atra) (an aa cuit, snysin, watter craw, beldie, whistlin deuk, hawkie, bauldpate, drink-a-penny, beld pout, snellie), is a member o the rail an craik bird faimily, the Rallidae. ↑ BirdLife International (2012). "Fulica atra". IUCN Reid Leet o Threatened Species. Version 2013.2. Internaitional Union for Conservation o Naitur. Retrieved 26 November 2013. ↑ Condon, H.T. (1975). Checklist of the Birds of Australia: Non-Passerines. Melbourne: Royal Australasian Ornithologists Union. p. 57. This page wis last eeditit on 10 Februar 2018, at 23:30.